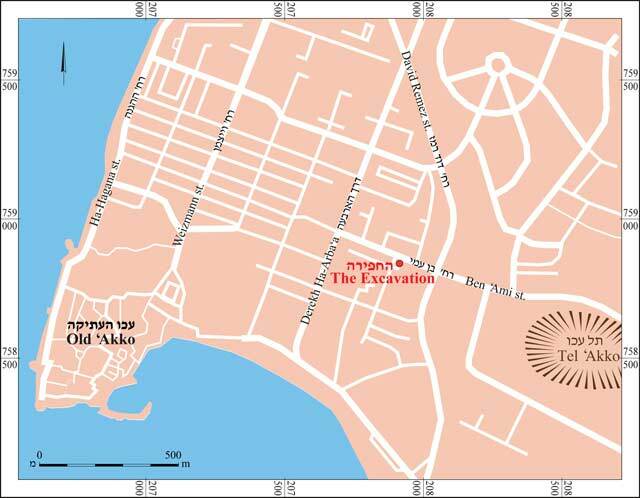 In August 2007, a trial excavation was conducted west of the Strauss factory in ‘Akko (Permit No. A-5223; map ref. 207908–34/758824–46), prior to enlarging the factory’s parking lot. The excavation, undertaken on behalf of the Israel Antiquities Authority and financed by the Strauss Company, was directed by E. Stern, with the assistance of L. Porat (area supervision), Y. Ya‘aqobi (administration), H. Smithline (field photography), A. Shapiro (GPS), Y. Gorin-Rosen (glass), H. Tahan-Rosen (glass drawing), Y. Kupershmidt (metallurgical laboratory), D. Syon (numismatics) and E. Belashov (plans). 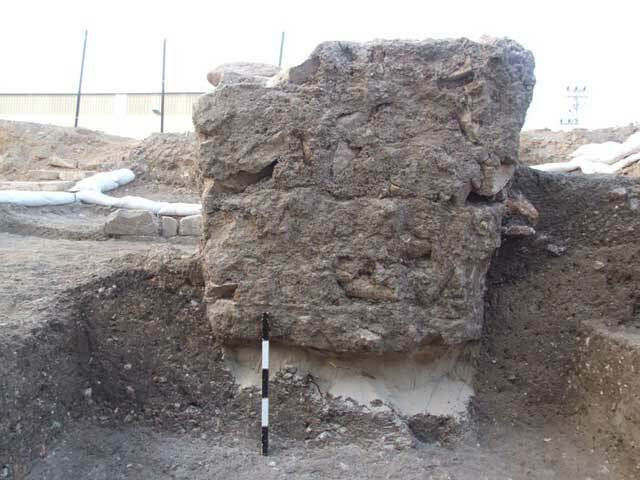 Two excavation squares were opened c. 330 m west of Tel ‘Akko (Fig. 1). The concrete foundations of buildings dating to the British Mandate, which were demolished in the 1980s, were discovered right below topsoil. Below these foundations were the remains of a Crusader-period building (Figs. 2, 3). It included four square pillars (1–4; upper dimensions: 1.2 × 1.2 m, height 2 m) that widened toward the top (Fig. 4). 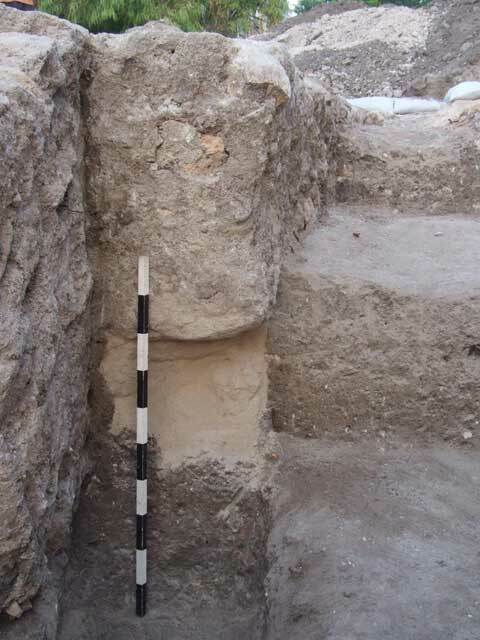 Two walls (W17, W19; exposed length 6 m, width 0.8 m, preserved height 0.4 m; Figs. 5, 6) adjoined the two western pillars. The two walls were built along an east–west axis, and they continued westward beyond the excavation limits. The pillars were built inside square pits dug in the ground (depth c. 2.3 m), and the walls were constructed inside foundation trenches that were dug into the ground as well. Clean sand (thickness 0.3 m) was poured at the bottom of the pits and the trenches. The pillars and walls were built of medium-sized fieldstones, bonded with lime-based mortar. The pillars were erected in an area that was sometimes flooded with water, and therefore seem to have carried a bridge or building that was reached by way of a road supported by the walls. 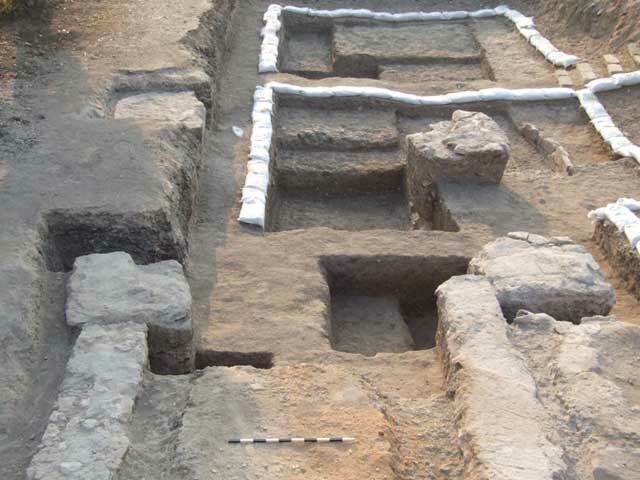 Several fragments of Crusader-period pottery vessels were discovered in the foundation trenches of the pillars and walls, which provide a date for the construction of the building. Soil (thickness 0.5 m) containing later ceramic artifacts, from the nineteenth–twentieth centuries CE, was exposed around the pillars in the upper part of the excavation area. Below this soil was heavy, dark brown clay alluvium, which yielded pottery sherds, fragments of glass vessels (Gorin-Rosen, below) and coins (Syon, below), most of which date to the Hellenistic period, and fewer to the Roman and Byzantine periods. It seems that finds in the alluvium originated in the adjacent area. 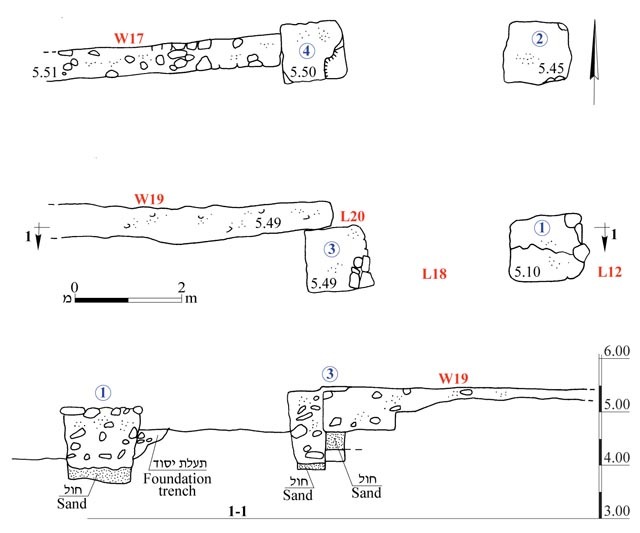 Sixteen coins were discovered in the excavation, of which only ten could be identified (Table 1). The coins are not related to the complex exposed in the excavation; they are probably associated with a main road that passed through the area. All of the coins are made of a copper alloy and are poorly preserved. Coins 1–3 were common in ‘Akko during the Hellenistic period. Coins 4–8 were also common, although coins of Jewish rulers (No. 6) have been seldom discovered in ‘Akko. Coin 9 is rare, and it seems this is the first excavation where it was found in the north of Israel. Coin 10 is also rare, although such coins have been discovered several times in Israel in Fatimid-period contexts. One hundred thirty glass fragments were found in the excavation, of which eighty are non-diagnostic body fragments. The fifty glass fragments that were identified date to the Late Hellenistic, Early Roman, Late Byzantine, Umayyad and Crusader periods. The glass artifacts from the Late Hellenistic period include mainly cast bowls with thick walls. Most were decorated on the inside with horizontal grooves. An unusual, undecorated deep bowl, which was probably conical, was found in the excavation. It has a rounded rim, is made of yellowish–green glass and is covered with a layer of silvery weathering and iridescent film (L20, Basket 146; Fig. 7:1). The same basket yielded a body fragment of another colorless, high-quality cast bowl, decorated on the outside with thin, widely-spaced vertical grooves (Fig. 7:2). This type, known as a fluted bowl, is considered one of the luxury vessels of the Hellenistic period; to date, the largest group of bowls of this type was found at Maresha (Jackson-Tal 2004:19–20, Fig. 10). Cast bowls from the Hellenistic and Early Roman periods were found in excavations within the city of ‘Akko as well as over a broad geographic distribution. The use of luxury bowls in ‘Akko reflects a high standard of living during these periods. The glass artifacts from the Early Roman period include a colorless, high-quality cast bowl with a delicate groove below a thickened rim (L11, Basket 115; Fig. 7:3). A similar bowl was found amongst the manufacturing debris of a glass workshop in the Jewish Quarter in Jerusalem and dates to the mid-first century BCE (Israeli and Katsnelson 2006: Pl. 21.23: GL202). The bowl was found in the same basket with fragments of blown vessels belonging to types dating to the Early Roman period. These include a delicately engraved body fragment that probably belonged to a beaker of a type found in a first-century CE tomb at the cemetery in the northern neighborhood of Berit Ahim in ‘Akko (Edelstein 2003: Fig. 3:2), and a double-folded bottle rim characteristic of assemblages from the first and second centuries CE. 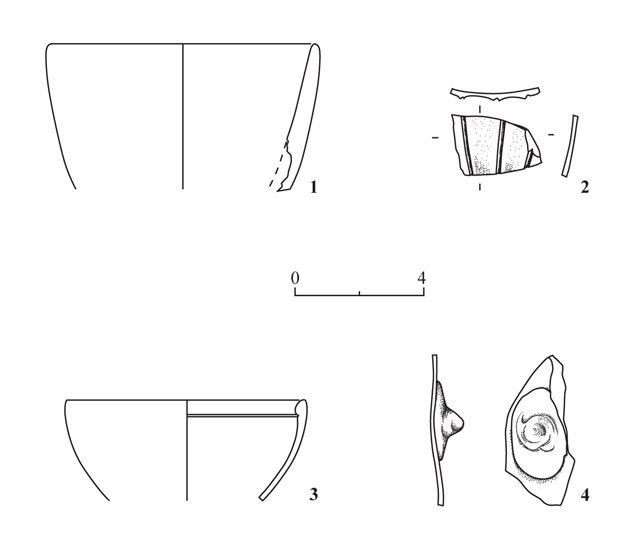 Other blown vessels from this period that were found in the excavation include a base belonging to a shallow bowl with a double-tubular peripheral ring (L12, Basket 133) and a delicate rounded bowl rim (L11, Basket 102). In addition, two small oval glass inlays were discovered. They have a flat base and a dome-like upper part, and are characteristic of assemblages of this period (L11, Basket 105; Israeli and Katsnelson 2006:419, Pl. 21.11: GL104–GL110). The glass ascribed to the Late Byzantine period includes tubular wine-glass bases, tiny fragments of rounded wine-glass rims (L10, Basket 100; L12, Basket 106), several glass tesserae and a base of a beaded stem lamp (L10, Basket 101); these vessels are very typical of the period. The lamp fragment also occurs in Umayyad-period contexts. The glass from the Umayyad period includes a neck fragment decorated with a thick, wavy trail (L10, Basket 100) and a small body fragment decorated with a tonged pattern; it was made in a technique that was first used in this period (L18, Basket 143). The Crusader-period glass finds include a body fragment of a light-purple beaker, decorated with a large prominent knob (L10, Basket 100; Fig. 7:4). The fragment was discovered on the surface together with vessels dating to the Hellenistic and Late Byzantine periods. It belongs to a prunted beaker, known from ‘Akko and other contemporary sites. The glass used to manufacture the vessel is characteristic of other bottles and vessels that were found in Crusader-period assemblages in ‘Akko (Gorin-Rosen 1997). The purple hue of the vessel and the rather large prunt distinguish this fragment from all the other fragments published to date from ‘Akko and from other sites in the country. The beaker is made of local fabric, and it is possible that prunted beakers were among the products of local glass manufacturing during the Crusader period. Edelstein G. 2002. A Section of the Hellenistic-Roman Cemetery at Berit Ahim, North of ‘Akko (Acre). ‘Atiqot 43:75*–98* (Hebrew; English summary 257–258). Gorin-Rosen Y. 1997. 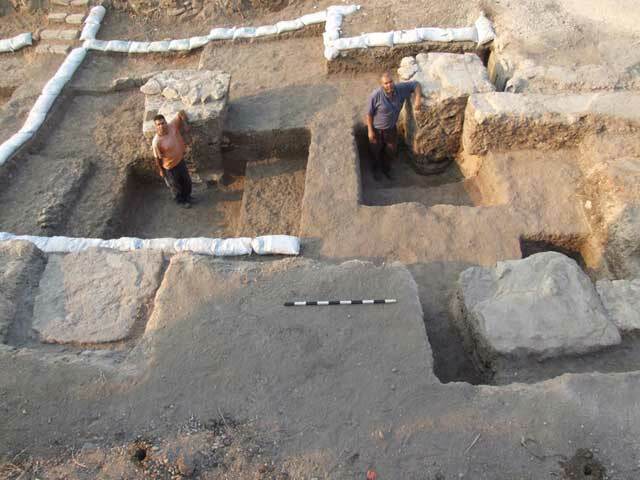 Excavation of the Courthouse Site at ‘Akko: Medieval Glass Vessels (Area TA). ‘Atiqot 31:75–85. Israeli Y. and Katsnelson N. 2006. Refuse of a Glass Workshop of the Second Temple Period from Area J. In H. Geva ed. Jewish Quarter Excavations in the Old City of Jerusalem Conducted by Nahman Avigad, 1969−1982 III: Area E and Other Studies, Final Report. Jerusalem. Pp. 411−460. Jackson-Tal R. 2004. The Late Hellenistic Glass Industry in Syro-Palestine: A Reappraisal.JGS 46:11−32. 3. The four pillars, looking south. 4. Pillar 1, looking south. 5. Walls 17 and 19, looking east. 6. Wall 19 adjoining Pillar 3, looking west.